It doesn't matter if you bought your computer 10 months or 10 years ago, somehow space disappears in an instant. Whether it's due to increasing files sizes, technological advancements, or simply the passage of time, sooner or later you're going to want more space and an external SSD is the perfect way to do so. There are, of course, cloud services, but it's best to keep your files in more than one place and especially one you can access even when there isn't internet available. Additionally, SSD drives are compatible with Mac, Windows, and Linux. They're also extremely fast, making for easy working and file transfers. In this buying guide, we'll help you pick a great SSD and showcase some of our favorites along the way. 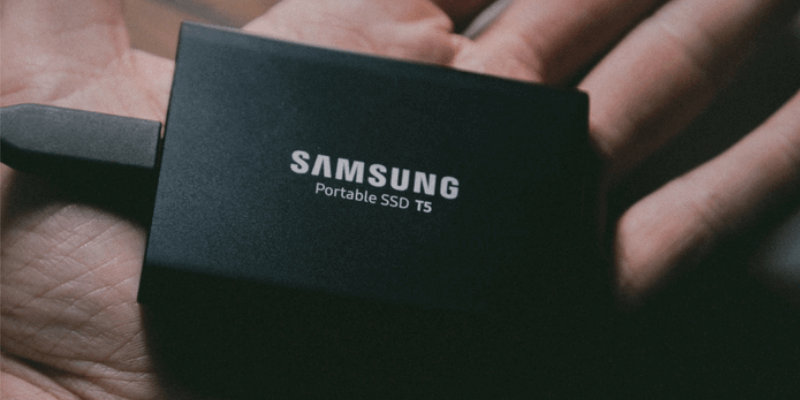 If you need a versatile and sturdy drive designed for the future both in terms of storage and technology, the Samsung T5 Portable SSD is your best choice. Its smooth metal exterior houses crazy fast read and write speeds and use USB-C. Looking to store a large volume of files? The VectoTech Rapid External SSD can be up to 4TB in space, while also boasting plug-n-play functionality, a strong warranty, shock resistance, and a light profile. But if you only need a little bit of space, go for Western Digital My Passport SSD Portable - it will make sure anything you need backing up isn't lost anytime soon. Built-in encryption, backup syncing, and data recovery software keep you covered digitally, and the drive can withstand drops near the 6-foot mark. Do you normally work with video or image editing, digital rendering, or create other artistic files? Are you worried about the safety of your files on your computer or cloud servers and want to back them up securely? Has your computer been running slow lately due to the massive amount of old files that need to be offloaded? Do you value speed and cross-platform functionality? If you can say "yes" to these scenarios, then you have a fairly good indicator that you would benefit from an external SSD drive. They work quickly and efficiently to create a safe space for your files. If none of these seem like you though, or if you aren't ready to commit to an SSD drive, you might be better served by a USB flash drive or HDD drive for storing your old and infrequently used files. Best Portable SSD Drives: What to Look For? The number one thing to consider with any external drive is the amount of storage it will provide you with. Although an SSD is more expensive than an HDD and might tempt you to compromise on space, don't let yourself! As time progresses you will much rather have one large drive than several small ones that you purchase over time and you will almost certainly wish you had gotten more storage in the first place. Plus, using multiple drives can slow your computer down, so it's best to get one that does it all. SSDs use flash memory rather than a physical rotating disk to store information, making them more stable than HDDs that are susceptible to physical damage. However, they come in two cell types: multi-level cell and single-level cell. MLC is cheaper and can store more data, but SLC has a lower likelihood of errors and therefore a higher accuracy. However, many SSDs include an error-correcting feature that will compensate for this difference, so it comes down to what you think will be best for your purposes. Any type of drive, including SSDs, have a rating for the time it takes to read and write information. The higher these numbers are, the better and more efficient the drive is. However, you should make sure to remember that any advertised speeds are likely overclocked or best case scenario only and that under real-world conditions, you'll experience speeds closer to around 2/3rds of the rating. Additionally, don't fall into the trap of an overpriced drive with only a slightly higher speed rating - in the end, it'll have similar results to its competitors. Please note that the items recommended below are picked mainly based on 1). the criteria listed above 2). our own hands-on using experience 3). reputation research we did, mostly gathering industry benchmarking test reports. Offering a range of sizes from 250GB to 2TB, the versatile Samsun T5 has incredible read and write speeds of around 540MB/s and uses USB-C to connect to your computer. No USB-C port? Don't worry - it also includes a USB-C to USB-A (the classic kind you know) cable in case you're using an older model computer that doesn't include this latest technology. USB-C connection allows you to use the drive with devices such as Android phones as well as your computer. Storage sizes available to fit the needs of almost every user, and the hard metal casing will withstand shocks and drops easily. None, this drive covers all of its bases. Going to need a lot of space? The VectoTech SSD comes in up to 4TB of storage at an impressive 450MB/s read and write speed. With a three year warranty, you can rest assured that your data will be well protected and secure and not worry about drops or technological faults. Easy to use, all you have to do is plug and play (comes pre-formatted for PC). Very light at only around 4 ounces, and is shock resistant in order to better protect your data. Doesn't offer built-in encryption software. Alternatively, those who don't need huge amounts of storage will find the Western Digital SSD a fitting solution. It comes in 256GB, 512GB, and 1TB sizes, with a sleek two-tone design and connects to your device with a USB-A or USB-C cable. Rated for 515 MB/s, an impressive stat. Built in 256-bit encryption means you won't need to look for 3rd party software to secure your sensitive information. Additionally, the drive can withstand drops to about 6 feet and includes features for auto-backing up your data to cloud services. This drive is built to protect your data at all costs. Requires some setup and is not "plug n play" easy to use on initial startup. Still aren't sure you need an external SSD? You can always try a cloud platform for storing your files before purchasing a physical drive. Dropbox and Google Drive both offer free trials and when you need more space, you can buy around a terabyte of storage space. This can help you figure out if you need constant or only occasional access to your files. 30% of people have never backed up, 113 phones are lost or stolen every minute, 29% of disasters are caused by accident. 1 in 3 iPhones are lost, stolen, or damaged during their lifetime - that's over 250M of the 795M iPhones active today. So, let's start to back up our data and do not let the data disaster strikes. Having an external SSD can really improve your workflow by providing a safe place for huge amounts of files while leaving them available at your fingertips. The fast read and write speeds will outperform any HDD on the market so you can access your documents in a flash, and you can improve the performance of your computer by offloading folders worth of data and clearing up space for a more efficient daily function. What external drives do you use to manage all of your files? Leave us a comment below and tell us what you like and don't like about any current drives you own!